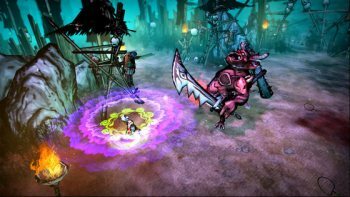 American McGee says Akaneiro: Demon Hunters is 100 percent complete, but he needs money from Kickstarter to finish it. Akaneiro: Demon Hunters, the free-to-play action-RPG from Spicy Horse, is just about ready to go. Alas, the studio ran out of money, at least according to its original Kickstarter pitch, and it needs $200,000 "to finish what we've started." But it turns out that McGee wasn't very happy with the coverage, or with the idea of the world thinking that Spicy Horse was broke. "The game is 100% finished," he said in an email to Kotaku. "The company is not out of money. The project was completed on time, on budget and will be shipped this month." So if the game is 100 percent finished, why the need for Kickstarter money? "When the Akaneiro team says they are 'out of money/time' it just means they came to the natural end of their development cycle on that project," he explained. "The KS campaign would allow them to extend that-something we'd ask a publisher to consider were we funded that way. We're not, so we ask the audience instead." "What's been achieved both artistically and mechanically is fantastic... but it's just not enough to call the game complete, to satisfy our fans or ourselves. THIS is the main idea. We're not satisfied. We'd like to take the game further and make it better," he continued. "As we are not publisher funded, and because we can't afford to continue development indefinitely, we're asking the audience - we're giving them a chance to decide whether or not these additional features sound worthwhile. Whatever the response, the game will launch this month (January 2013) in a state that is 'final' per our existing internal schedule and budget." The Akaneiro Kickstarter page has since been modified to remove the line about being out of time and money, but it still states that "we feel some key features are missing." So is it 100 percent done or not? I'm leaning toward "maybe," with a slight bias toward "yes." Unless it's "no." In other words, I have no idea.